TNT authors have a reputation for pushing the boundaries of audio and investigating everything from mains quality to listening room in our attempts to increase your listening pleasure. The destination board on the psychedelic schoolbus carrying the Electric Kool-Aid Acid-Test crew of Ken Kesey carried just one word: "FURTHER"
TNT-Audio takes you further in the pursuit of greater audio glory as we attempt to upgrade the final link in the chain: your ears. Ears are often poorly calibrated and badly maintained, indeed rumour has it some reviewers writing elsewhere are using ears damaged by years of neglect and exposure to sub-standard speakers. Headphone reviewers are particularly prone to high-frequency loss due to the spectral balance of headphone transducers & the high spls (sound pressure levels) possible when clamping tweeters (that's what moving-coil headphone capsules look like to me) to the sides of your head. Assuming you have not harmed your ears by driving them into clipping while sitting in the bass-bins at a Ted Nugent concert (does he still hold the loudest p.a. world record?) and assuming you have never been involved in artillery in the armed forces, what other steps can you try to improve your own audio performance? At hifi shows in the 80s I recall some company gave away cardboard giant ears to extend your pinna (the visible part of your ear) ostensibly to hear their superior products better. Try this experiment: face your hifi and cup your hands behind your ears. Does it sound different? OK now put a record or cd on and repeat the experiment. NOW does it sound different? 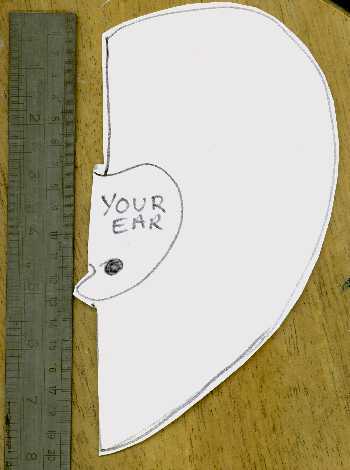 So you could now make big cardboard ears and try the full experiment using the diagram as a guide adapted to your pinna size. You will notice that although the sound becomes louder with more precise positioning of the instruments, it also becomes horribly coloured. What it illustrates is that ear-tweaking has a much more dramatic effect than anything you can do to you hifi. Some audio marketplaces already know this. remain stationary in any public park or street corner in southern India while enjoying the sights and you may well be approached by an individual offering his most excellent ear cleaning services. Sweeping aside your protestations he will peer into your pinna and announce that he can see some soap left in there from your morning ablutions. He will proffer testimonials typed on ancient Regals and Olivettis and signed by the great & the good. He will demonstrate his extensive range of apparatus carried in a small attache-case and show his certificate of competence to use it. Indian hifi enthusiasts clearly take their aural hygiene very seriously and no doubt benefit every time they sit down for an evening in front of their systems. ENT specialists (Ear Nose & throat) recommend that the only implement you should ever put into your ear is your elbow. That's right, no cotton buds, toilet tissue or kitchen roll should ever be put into your ears. Nor should matchsticks, ball-point-pen lids nor pencils. The common practice of licking one's pinky (little finger) and wiggling it in one's ears while waiting at traffic signals is repellent to occupants of the car behind and does no good at all. Ear cleaning kits are available at drugstores in some states of America, that include droppers for warm oils and a rubber-bulb for propelling warm saline solution into the earhole. On a recent trip there to visit some audio shows I decided to buy some and try them. Did they make a difference? Yes they did. Every audio aspect was improved. Comparative tests had to become the norm as my audio memory was coloured by old earwax and the post-cleansing experience was so much better that I realised I must not make any purchases until I returned home and recalibrated my existing system with my new ears. It proved impossible to tell which of the three kits was more effective. Obviously the first one cleaned out the accumulated ear-dross of several years, whereas the other two only had a few weeks of dust, debris and coagulating wax to contend with. Hence, I propose TNT readers worldwide rush out today, Saturday morning April 1st 2006, and purchase an ear cleaning kits of their choice. Then get it used on your ears by someone professionally qualified to do so (amateurs should never be allowed to undertake quasi-medical procedures on your body). Finally, do post your findings on the TNT forum. If enough TNT readers respond we may amass enough evidence to demonstrate the superiority (or not) of the audio experience after proper aural hygiene. TNT-audio would never endorse or encourage readers to undertake any procedure that may cause disomfort or even damage to themselves. Do take appropriate medical advice before undertaking anything not already a familar and established custom and practice.